William Frederick Longstaff (1879-1953) was a cousin of the portrait painter Sir John Longstaff. From 1900 to 1901, Will Longstaff served with the South African Light Horse in the Boer War. 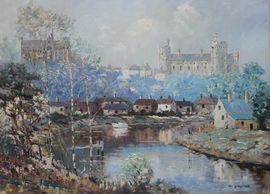 Following his return to Victoria, he taught art privately with Leslie Wilkie at Eltham. He enlisted with the 1st Australian Remount Unit in October 1915 and served in the Middle East, where he made pictorial records of the ANZAC Mounted Division and the Desert Column. He then served in France before being invalided to England in October 1917. In 1918, Longstaff was trained in camouflage work in London with fellow Australian artists Frank Crozier and James F. Scott; he was subsequently appointed an official war artist working as officer in charge of camouflage for the 2nd Division AIF in France, where he saw out the end of the war. As an official war artist he depicted a variety of subjects, including landscapes, buildings, battles and allegorical scenes. After the war, Longstaff joined a group of artists working for the Australian War Records Section at the St John's Wood studio, London, preparing material for display in the proposed Australian War Memorial. These included paintings depicting the battle of 8 August 1918 and the breaking of the Hindenburg line (25 September). Longstaff later moved to Sussex, where he lived quietly with his second wife and two children. Longstaff's Menin Gate at midnight is one of the best-known paintings in the Australian War Memorial's art collection. In the years following the First World War, this painting's tribute to sacrifice, combined with its spiritualist overtones, struck exactly the right chord with many Australians who had lost family and friends in the war. Longstaff painted the work after he had attended the unveiling ceremony of the Menin Gate memorial at the entrance of the Belgian town of Ypres on 24 July 1927. This memorial was dedicated to the 350,000 men of the British and Allied forces who had died in the battles around Ypres. It was purchased by Lord Woolavington in 1927, who in the same year presented the painting to the Commonwealth of Australia.